Woo-sung Jung, Jeong-min Hwang, Ji-hun Ju et al. Detective Han (Woo-sung Jung) has for years been secretly doing dirty work for the corrupt mayor Park Sungbae (Jung-min Hwang). However, when an investigation is raised against the mayor, Detective Han is pressured by a ruthless prosecutor, Kim Cha-in (Do-won Kwak), to cooperate. Feeling trapped, Han persuades his young partner Sunmo (Ji-hun Ju) to take over his work for the mayor, but things start to get tangled in unpredictable ways. As things are getting worse, only the most evil survive in the dark and dangerous underworld. 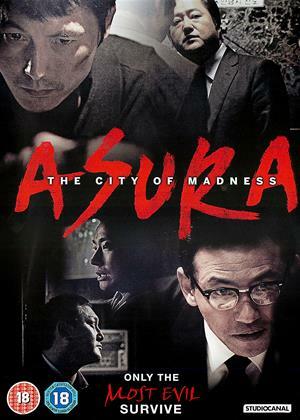 Hard-boiled Korean thriller about a cop caught between the battle lines in dirty political dealings. It’s an immersive experience. The acting may be a bit in-your-face for western tastes and the film’s central section perhaps layers on the intrigue for too long, but every scene crackles with menace. After 70 minutes there’s one of the most exciting car chases you’ll ever see, with the screen filled with heavy rain and startling images. Like in Gravity, the virtual camera movements are so impossible you’ll want to watch it again. After the viewer is given a breathing space the extended 30 minute no-holds-barred action climax will have you hiding behind the sofa. Unlike in many modern Hollywood thrillers, the action is realistic and involving, tracked smoothly by the camera and not sliced to pieces by rapid editing. It may be too bleak and bloody for some, but director Kim Sung-Soo delivers one helluva ride.